Most of the mobile manufacturing companies launch different kind of smartphone as per the user need. These Android phone comes with different great features. Most of the smartphone users complain about the speaker quality and volume level. These issues is found most of the smartphone manufacturing companies. So, today we have to provide the solution how to increase volume and improve sound quality on Android phone. If you face sound problem on your Android pone then this article will helps you. 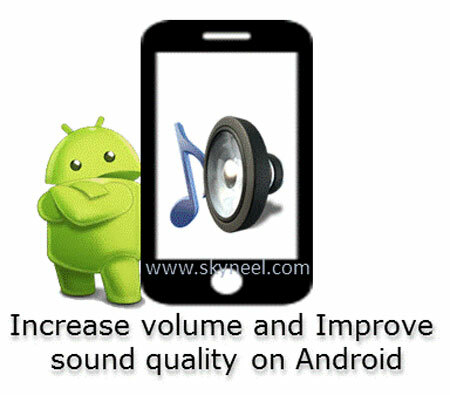 You must take few given five important tips to increase volume and improve sound quality on Android phone. Lot of person put his Android phone in a cover for the protection. It will affect on the sound quality because most of case close the sound hole. Most of the mobile manufacturer companies built specific design for a particular handset. You must have to use the cover as per the phone model to get better sound. Most of the smartphone manufacturer companies provide twin speakers grills for provide better sound. But most of the users put a plastic cover on the speaker holes, which affect the sound quality and volume. So remove the cover from speaker holes go get proper sound volume. Most of the person put the finger on the speaker hole during attending the phone call. You must keep in mind these few important things to increase volume and improve sound quality on Android. You also have an option to increase volume and improve sound quality on Android by using any music app. These music app provide different great features to build the sound quality much better. There are lot of music app available on the Google play store just like Music Volume EQ. Music Volume EQ provide the five band Eq facility with bass boost and virtualizer effects. If you want to download Music Volume EQ from Google Play Store then click on this link. Most of the smartphone manufacturer companies does not provide better sound quality except HTC. Due to which few music lovers install any music app in his Android phone. Some music apps provide better sound quality when you plugin the headphones with your phone. So, during listing music or calling to other person in a lot of rush area, you must have to use headphones. It will not only provide better sound quality but also you will be able to listen voice clearly. Most of the person know very well after rooting the phone you will get administrator rights to control your phone. After rooting the phone you will be able to manage different apps to increase volume and improve sound quality on Android. If you don’t know about the rooting then you must read this article root advantage and disadvantage. I hope after reading this article you will get the proper solution to increase volume and improve sound quality on Android phone. Give you important suggestions regarding this article in the comment box. Thanks to all. my phone lost sound please completely please help. my micromax a110 is rooted (and flashed,and updated to jellybean thanks to you). please could you instruct how to increase the sound quality on a rooted phone?